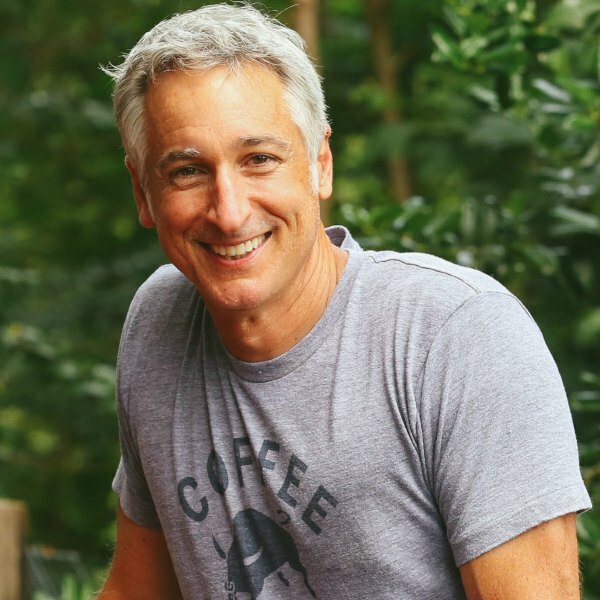 In this podcast, we continue our seed starting discussion with guest Craig LeHoullier. In Part One of the Starting Seeds Indoors: The Non-Negotiables for Success series, we brought the seeds from initial planting through germination. We also touched on how to harden off seedlings as well as methods for providing moisture and light.At this point in our timeline, the seedlings are about 2-3” tall. So, what’s next? It’s time to set those crowded seedlings free from the confines of their initial germination space. So, when is the best time to transplant? Seedlings are ready to transplant into a slightly larger container once they have grown to 2-3” in height. Once seedlings are 2-3 inches tall, they’re ready for transplanting. Weather permitting, they’ve already spent some time in the sun. For some gardeners, transplanting these delicate shoots seems tedious or intimidating, but with an understanding of the basics and a bit of practice, you can really begin to have some fun with it. I am frequently asked which soil type is best for transplanting. Craig recommends using soilless mix beyond germination and into the transplanting phase because it’s sterile and doesn’t include fertilizer. More time in a sterile medium means less risk of disease during early growth, and the seeds themselves as well as the light you provide during germination offer enough energy and nutrients for the seedlings to thrive. Most soil options do include fertilizer, and it may benefit your seedlings to withhold feeding in these early stages. 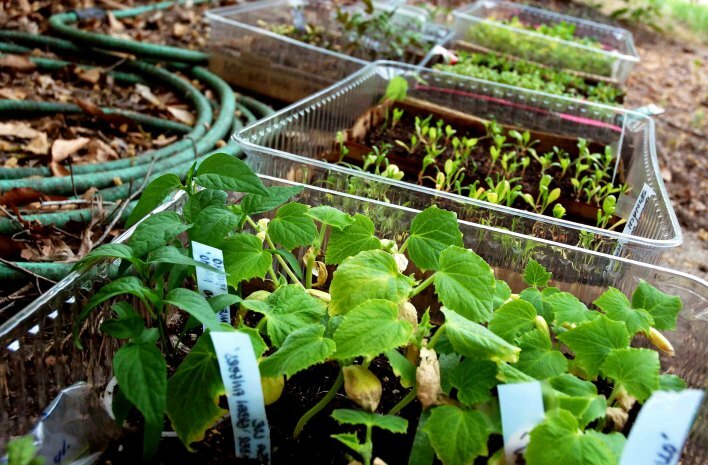 Seed blocks, peat pots, and plastic containers can all fit the bill. As with seed germination, drainage remains the key factor when choosing containers. Consider portability as well. Bear in mind how often you will be moving the containers in and outdoors before the final threat of frost has passed and your plants can remain outside. Craig transplants into plastic pots which come in strips with a perforated edge for easy separation at a later stage. Your seeds were planted and germinated in groups clustered together in a cell, but each seedling should be transplanted into a single cell or small container. Seedling groups germinated in a fluffy soilless mix will come apart easily for transplanting, and there will be minimal root damage – all thanks to the lightweight consistency of the mix. Once separated, take a look at the roots of the seedlings in the group and select the shoots with the most robust root system. Although planted at the same time and living in the same conditions, your seedlings will have developed at different rates. Selective transplanting will increase your success rate and nurture the plants which are most ready to grow into their next stage. With that said, don’t give up on those less vigorous seedlings. Gather them back into smaller groups, place them into the soilless mix under a light source, and water. Those seedlings will continue to develop the more robust root system necessary for successful transplanting a bit later. 2. Lay a young seedling on top of your dry planting medium. 3. Ease the young shoot into the medium by placing your thumb or finger just behind the cotyledon leaves and gently pressing down. The roots will be buried, and the plant will be submerged up to the cotyledon leaves. Quick and simple, right? 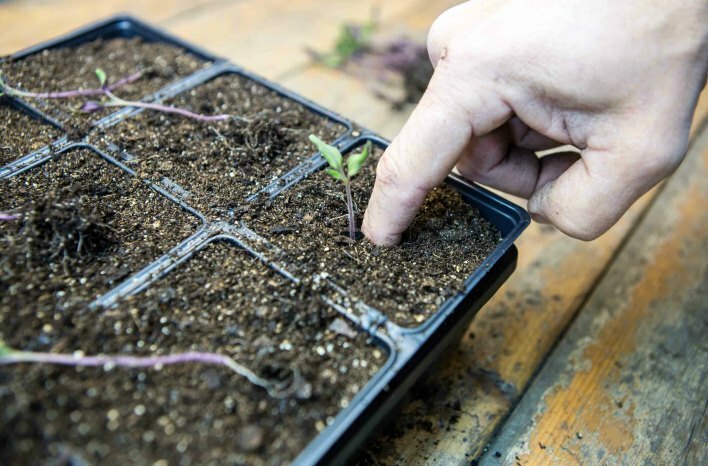 This method may sound risky, but with a bit of practice, you can become a pro at transplanting without breaking a sweat or investing an entire afternoon. (Watch Craig’s technique in action). Even if you get a bit aggressive and snap off the root, all is not lost! Simply ease the top of the shoot into the soilless mix, provide moisture and light, and your tiny “victim” will re-develop roots and be ready to thrive once more. 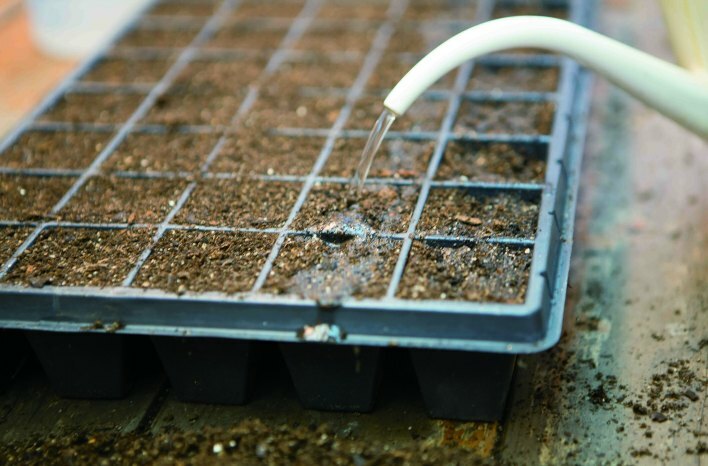 Seedlings need to be watered immediately following transplanting, and once again, there are different approaches to this. In Part One of this series, we touched on the method of bottom watering. Another method is to water from above. Watering from above (top watering) is preferred by some gardeners (including Craig), but your plants are more susceptible to disease when their foliage becomes wet. 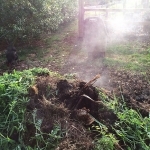 Disease and fungal agents can be airborne or present in the soil. This is just another reason that using a sterile soilless mix can improve your success rate. If you’ve used a soilless mix, the risk of disease reaching your seedlings is much lower. If you choose to top water, be sure to target the spout of your watering can at the base of the plant. This directs the water to where the plant needs it most — near the roots which are all still relatively close to the planting surface. By avoiding the foliage and using a soilless mix, you can reduce the risk presented by top watering. As with each step in the seed starting process — experiment. Figure out which watering method you prefer and find success with. 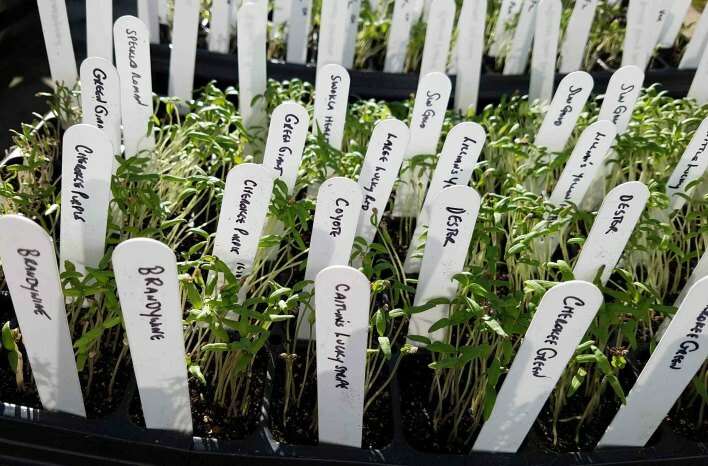 Now that you’ve completed transplanting and provided all those seedlings a drink of some fresh water don’t forget to label your tray. Labels help to ensure you won’t forget, in coming weeks, what you have growing in each tray. Leggy growth (the stretching of the plant to the light) will always be an issue for plants grown indoors. This can be minimized by providing as much supplemental light as possible. Legginess doesn’t just look bad — it can impact the health of your plant. Leggy, spindly plants are top-heavy. They can topple over, causing the stem to snap. What to do for those leggy seedlings and plants? Plant those seedlings deeper during transplanting. Any portion of the plant submerged in planting medium will set roots. Take advantage of this phenomenon when transplanting by submerging the plant to the depth of the cotyledon leaves as a seedling – or even up to the top layer of leaves for more mature plants. In short, leggy growth can be corrected by planting as deeply as possible. 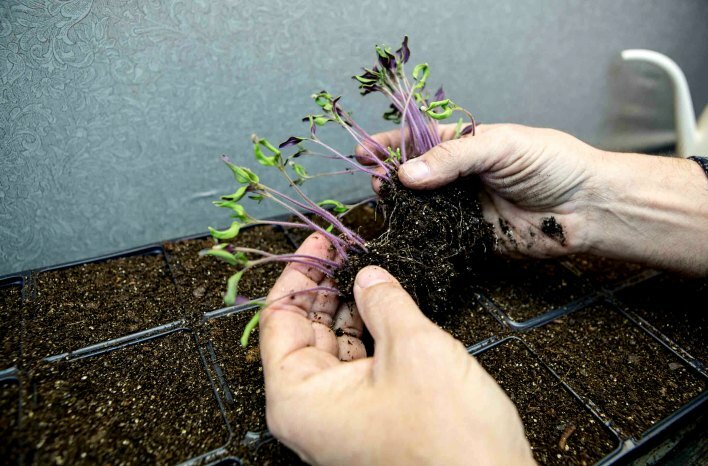 Pinch off the top few inches of the plant and set that clipping into a glass of water or back into the soilless mix under grow lights to re-form roots. Add the remaining portion of the clipped spindly plant to your compost pile. Re-rooting will take about a week – falling a bit behind your planting schedule – but better late than never. Craig’s seedlings are planted deeply, so just the first set of true leaves are above the soil surface. 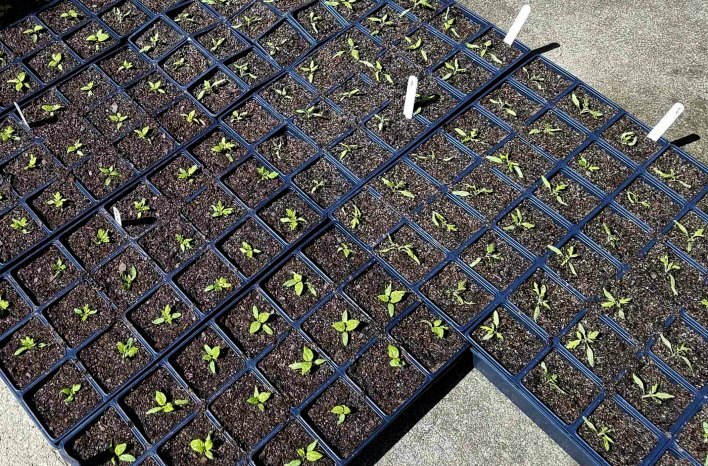 It’s fairly common knowledge that deep-planting is beneficial for tomatoes, but this deep-planting approach can be utilized for all types of plant seedlings as you make that first transplanting step to larger containers. 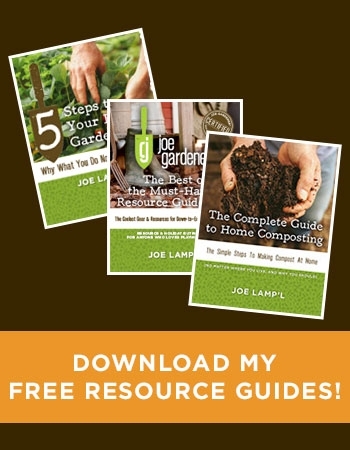 By planting your eggplants, peppers – even your spinach starts – and more up to the “true leaves”; there will be more seedling stem area on which to develop roots, and more roots mean a more robust plant when it’s time to plant outside. 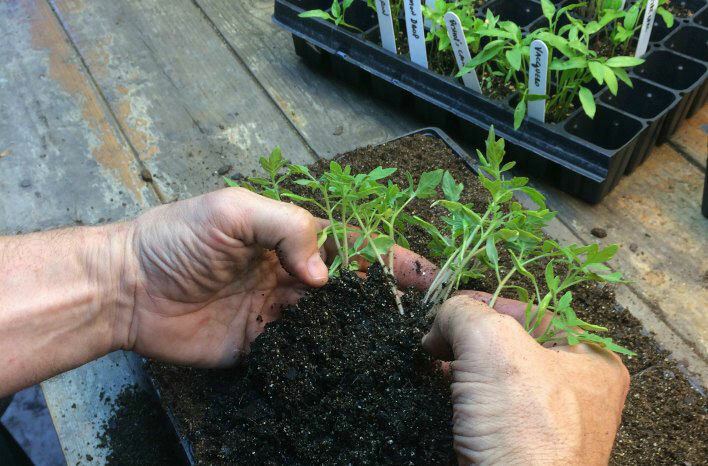 Even the most delicately-transplanted seedlings need a bit of time to adjust from their cozy, group environment into their individual containers. Be sure to let them settle in for a few days before beginning (or continuing) to expose them to sunlight and outdoor conditions. We discussed hardening off seedlings in Part One and the necessity of allowing those seedlings to adjust – in incremental steps – to sun and wind and variable temperatures. But what if you don’t have the time to be moving your plants all throughout the day? Before Craig’s retirement, he worked full time and wasn’t home to be moving his plants every hour or two. His solution? Each morning, he would water the plants well and place them under the trees in his yard. The dappled light under the tree canopy ensured his seedlings were exposed to brief, alternating periods of sun and shade throughout the day. 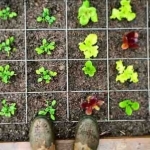 If you use this method, be sure that the temperature is mild (approximately 40 degrees F) and that your seedlings are protected from much wind. Exposure to some wind is a benefit to your plants – encouraging them to develop sturdy stems and strong roots. However, prolonged exposure to wind at this early stage can dry out and kill tender seedlings, so take precautions. I look for every opportunity to harden off my new seedlings. For days when I can’t monitor them as closely, I chose a place near the house and under shade to provide wind protection and dappled shade. 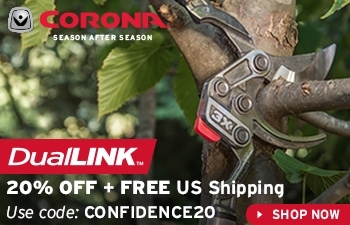 Once your plants have been hardened off, and temperatures are generally remaining above 32 degrees F, consider keeping your plants outdoors full-time. Year after year, Craig’s driveway has become home to the containers of his thousands of young plants. And when you do make a move to keep young plants outside, be sure to keep a close eye on the weather. 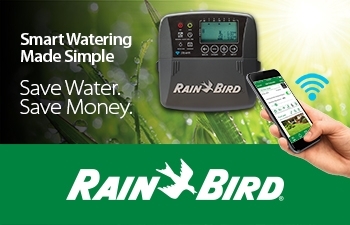 Get to know your own yard environment – also known as a microclimate – by keeping track of how the temperature in your yard compares with the official temperature report. 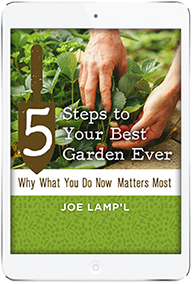 This familiarity will help you avoid the risk that comes with keeping your plants out during those earliest, unpredictable garden season days. If temperatures are expected to dip below 32 degrees F, cover and protect your young plants overnight. Row cover material can trap and hold slightly warmer air near your plants’ tender foliage. 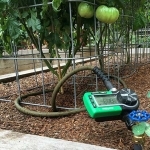 The degree of protection can depend on the surface under your plants. Craig’s containers sit on the concrete of his driveway. (Want to check out Craig’s set up? Watch the episode.) When colder temps are predicted overnight, he covers his plants with a double layer of row cover before the sun has gone down and tucked the cover around the edges. The warmth of the concrete continues to radiate up to the plants during the night, increasing the air temperature under the covering by several degrees. If your containers sit on the grass, the trapped air may not be several degrees warmer but should offer a few degrees above the external temperature. Covering your plants overnight may not guarantee your plants will survive a cold night, but it might provide the edge you need if – as with Craig’s system – moving your plants indoors isn’t an option. Even as his plants reach around 8” in height, Craig isn’t fertilizing. He typically withholds supplemental nutrients until plants are approximately one foot tall. From germination until they reach that 12” mark, plants are busy developing foliage and roots. They achieve this growth on their own through their chlorophyll and photosynthesis (the process of plants to produce energy by processing light). 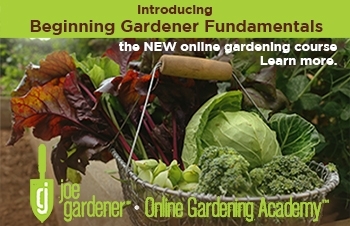 It’s not until plants begin to produce flowers, set fruit or put out suckers that they expend much more energy and really begin to require supplemental nutrients. 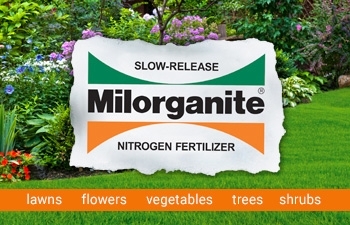 That said – if the foliage of your young plants looks pale, you can see improvement (or just have more peace of mind) by giving the plants a very diluted (10 percent or so) fertilizer. It’s worth noting that foliage color can seem dull or faded at certain times of day, so checking at different times will be the best way to gauge foliage health. Sometimes your young seedlings may appear to be stunted in their development. As long as leaves don’t look wilted or discolored, there is probably no reason for concern. Remember that your plant may be focusing its energy below the surface, rather than above. This root development may test your patience when you’re anxious to see vigorous greenery, but as daytime temperatures rise to the 60 degree F range and nighttime temperatures are also warmer, these young plants tend to enter a super-growth period of more robust foliage. Young seedlings are very susceptible to garden pests. Aphids and Flea Beatles in particular, are very attracted to fresh, young growth. Taking a few minutes to look over your plants each day can save you a lot of time in fighting an out-of-control pest infestation. It’s heartbreaking to discover that the time invested in growing your young plants has gone to waste because pests got the upper hand and killed your crop. 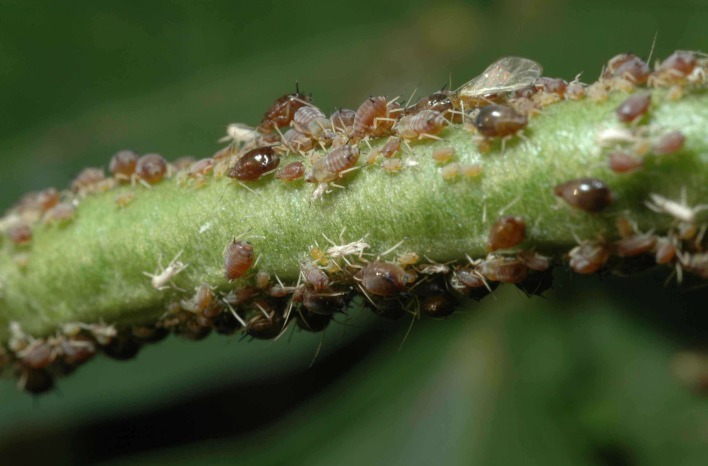 Aphids are a common garden pest and are often found on tomato seedlings. Fortunately, they are easy to control. 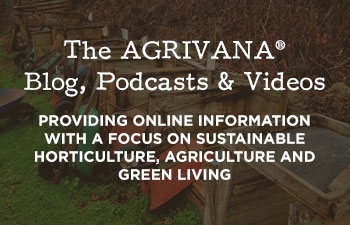 If you find evidence of pests or disease, check out my other podcasts and blog posts in which I discuss garden pests and dive into organic pest control methods. Craig has success controlling aphid attacks by washing the infested plant area in a stream of water and squashing the pesky plant-suckers with his fingers. Placing floating row cover over your plants can be an effective barrier to protect plants from initial infestation during this young stage, without blocking that critical light source. Once they grow and harden off further, your plants will be better equipped to fend off pests on their own and be less attractive targets. 1. First and foremost, Craig’s dense seed germination technique significantly reduces the amount of material used in that first stage. 2. Buy rigid 50-cell plug flats. These can last years and be more cost-effective than the one-use-per-season, disposable variety. 3. Keep using those seeds until their germination rate has really dropped off. Seeds can remain viable for years! So barter, save seeds from your own garden, and keep those extra seeds left in a seed pack. Label and store them in a cool, dark place until you are ready to germinate. 4. Use inexpensive, 40-watt shop lights rather than a complex garden-specific system. 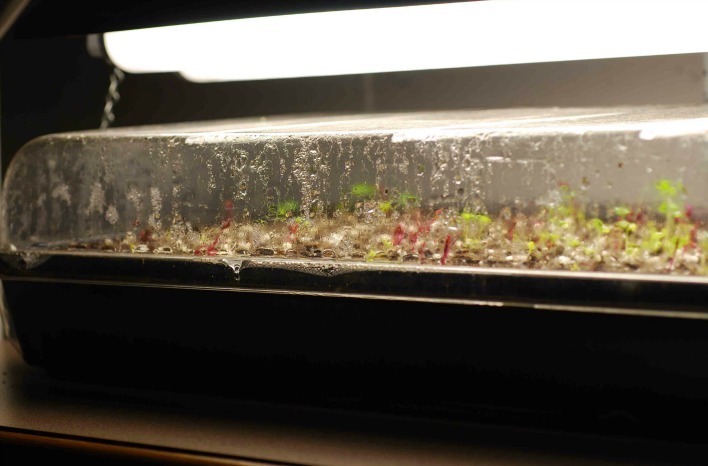 Inexpensive shop lights using 40W fluorescent bulbs are a very economical and effective way to get young seedlings growing strong. 5. A greenhouse is a luxury – not a necessity. Not everyone has space or a budget for a greenhouse, but by following Craig’s techniques and the tips discussed in this series, you can find creative solutions for bountiful results, regardless of your environment or the volume you wish to produce. 6. Minimize tools and products. Look for shortcuts that suit your lifestyle. For example, Heat mats may be recommended for quick germination, but if you are willing to wait a few more days, you can find just as much success (and save a few bucks) without the mat. 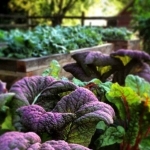 Gardening is not a one-size-fits-all process. Gardening is a journey and, for most of us, it’s the joy of learning and those discoveries or tricks that keeps us coming back for more. Understanding the basic rules and guidelines is a great start, but don’t limit yourself to those industry standards. Keep learning. Keep experimenting. Keep sharing your successes and failures. There is always more to learn from each other. 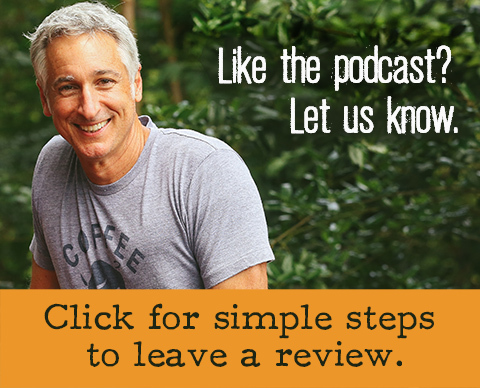 I would love to hear what works for you. Take a moment to share your comments and experiences below. I may have an opportunity to share your story in future posts and podcasts. Now that you’ve gotten through part two of the series, be sure to finish off with our final part three. 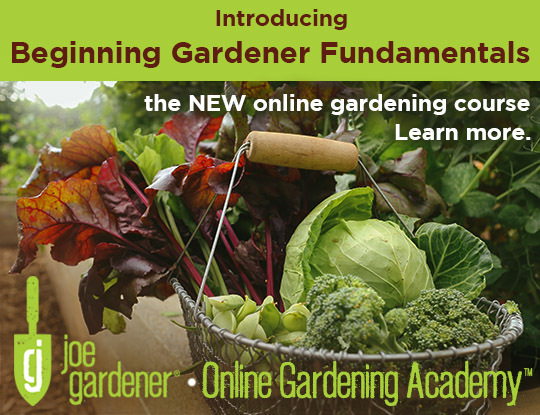 Our guest expert is John Porter – the newest member of The Garden Professor’s Group. 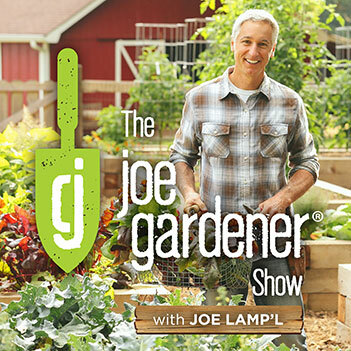 In this podcast episode 39, John takes us into an even deeper dive of the whole seed-starting process, including new lighting options and technology. As a final note, I want to announce for all you Alexa users that The joe gardener Show podcasts are now available through the Alexa AnyPod skill. Be sure to check that out.